Namor and the android Human Torch are the 2 seminal Marvel Comics characters, appearing in 1939. Namor the Submariner is the superhuman scion of a species of undersea men from Atlantis, and something of an anti-hero with exaggeratedly regal temper. 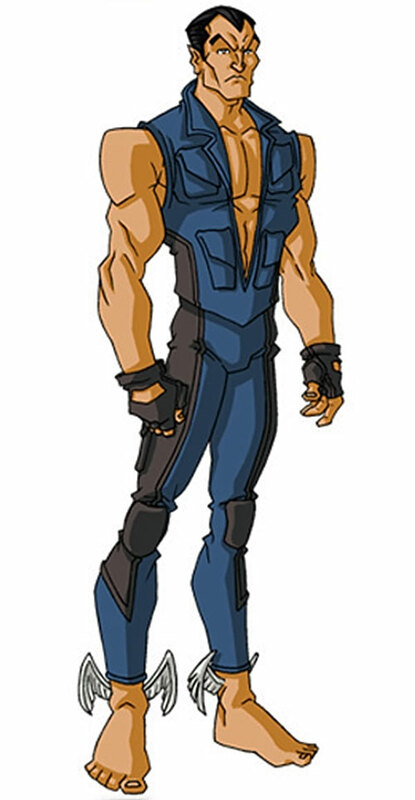 He continues to appear to this day, often in his own comic book. These are older, gisted technical notes, not a full profile. The idea was primarily to establish rough DC Heroes stats for Namor, since he’s such an important benchmark character. Real Name: Namor McKenzie the First. Other Aliases: Prince Namor, The Avenging Son. Known Relatives: Leonard McKenzie (father, deceased), Princess Fen (mother, deceased), Dorma (wife, deceased), Marina (wife, deceased), Namorita (cousin), Dorma (cousin, deceased), Byrrah (cousin), Namora (deceased), Thakorr (grandfather, deceased). Group Affiliation: None, formerly the Invaders, the All-Winners Squad, the Avengers, and the Defenders. Base Of Operations: Mobile, formerly Atlantis. Height: 6’2” Weight: 320 lbs. 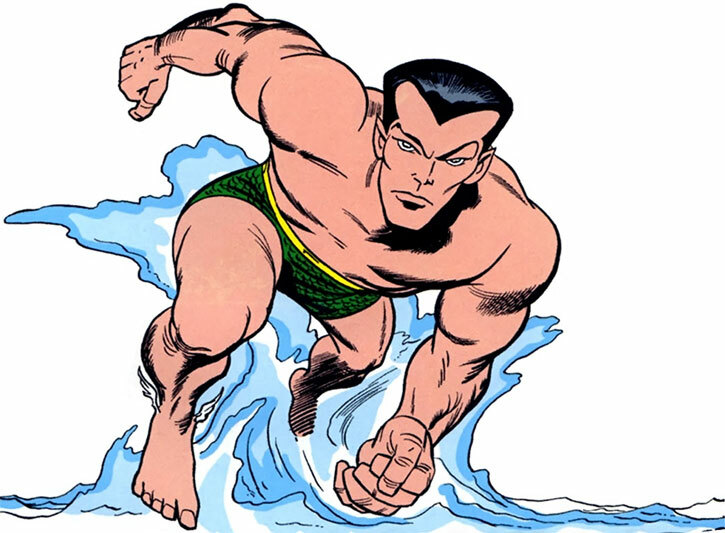 Namor’s dual Human/Atlantean heritage allows him to live and breathe comfortably both on land and in the sea. He has immense strength and speed that is most effective in the ocean, diminishing on dry land. He also possesses small fin-like wings on his ankles that enable him to fly in some improbable comic-book manner. 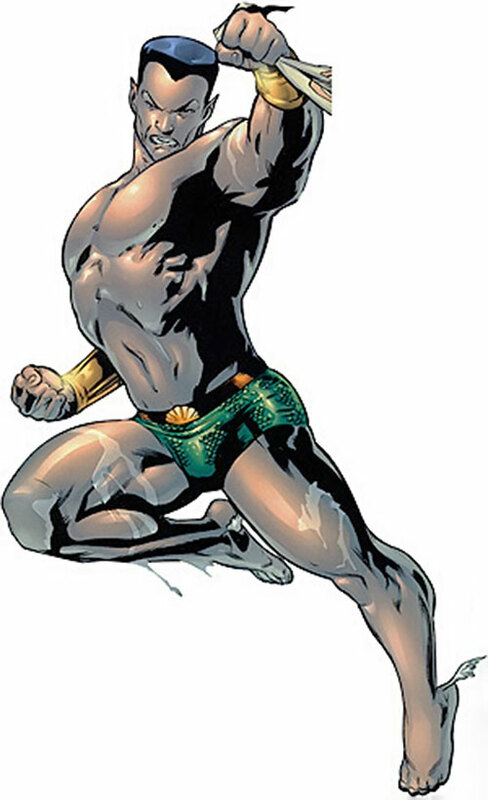 Namor was born the hybrid offspring of Princess Fen of Atlantis and an American seaman, Captain Leonard McKenzie. McKenzie’s ship, the Oracle, was searching for an undersea Lemurian city at the behest of one of his passengers, Paul Destiny. Destiny knew that it held the Serpent Crown, an immensely powerful artefact. However, McKenzie distrusted the uses to which Destiny would put it. He ended up causing an avalanche to trap Destiny, which mistakenly buried the city as well. The damage to the city inspired King Thakorr to send his daughter Fen to investigate. Fen was captured, and she and McKenzie were instantly captivated by one another. Fen and McKenzie were married soon afterwards. Several weeks after Fen failed to return to Atlantis, Thakorr sent a rescue party, and the ensuing scuffle killed McKenzie. Fen returned to Atlantis, and 9 months later Namor was born. 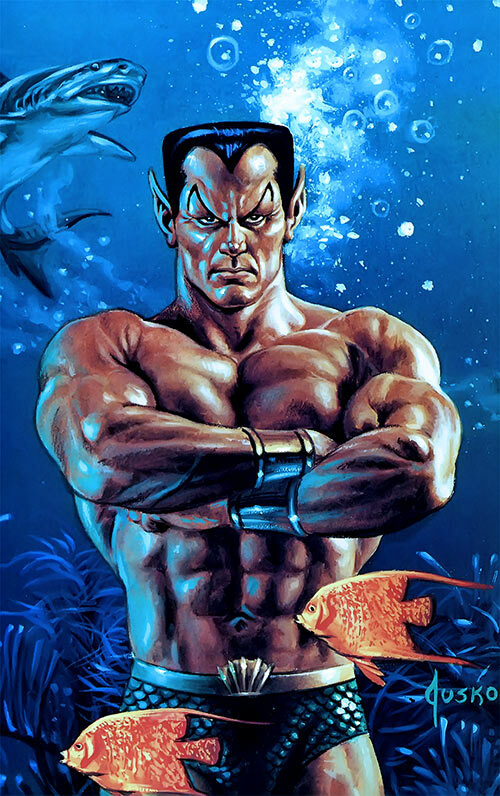 Like the rest of his people, Namor grew up with a hostile attitude towards the surface people. When Thakorr discovered men in diving suits near Atlantis, he assumed that they were the precursors to an invasion force. 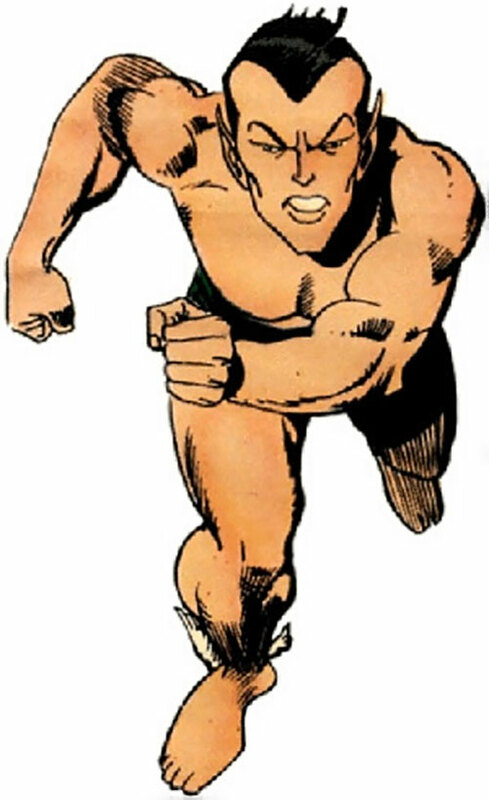 He ordered Namor to attack New York City, where he encountered the human Betty Dean and fought the original Human Torch. Shortly thereafter Atlantis was attacked by Nazis, and Namor joined the Invaders (and later the All-Winners Squad). He fought alongside Captain America, the Human Torch, Spitfire, and myriad others against the Nazis and the renegade Atlantean scientist Merrano. Atlantis had escaped much of the fighting during WWII and Namor returned there after the defeat of the Axis Powers. Some time later, the realm was damaged by severe earthquakes. Namor was dispatched to NYC to investigate, and he fell afoul of Paul Destiny, who had finally obtained the “Helmet Of Power” (actually the Serpent Crown) and was causing the quakes. The Crown’s power destroyed much of Atlantis, killing both Thakorr and Fen. Under compulsion of the Helmet, Namor returned to NYC with amnesia, and became a vagrant. Namor was eventually discovered by Johnny Storm in the Bowery. Burning away the extra hair and substantial beard which Namor had grown, Storm then dropped Namor in the harbor. The immersion restored most of Namor’s memory, and he then spent the next 10 years fighting myriad parts of the surface world, both alone and as the Monarch of Atlantis. Eventually, Namor lost his hate of the surface world. He renewed ties with many of his former allies, eventually joining his comrades Captain America and the original Human Torch as an Avenger. During his career he has alternated between ruling Atlantis and being exiled, either due to events in Atlantis or his own desire to be away from it. Since adjusting his attitude, the Sub-Mariner has fought alongside — and even fallen in love with — members of the opposing species, including the Fantastic Four’s Invisible Woman. To defeat the techno-wizard Yandroth and his ultimate computer, the Omegatron, Namor joined forces with the Incredible Hulk, green-skinned engine of mass destruction, and Dr. Strange, Earth’s Sorcerer Supreme. Thereafter, this loose-knit band of Defenders would unite periodically to oppose threats to humanity. However, a prophecy of doom forced the original three Defenders and the Silver Surfer, lone sentinel of the spaceways, to close the books on their semi-successful partnership. 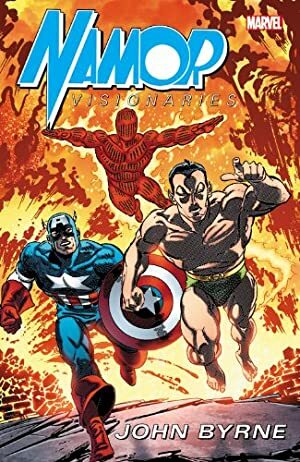 The condemnation was revealed to be a hoax, but Namor did not return to the Defenders at that time, and the team eventually disbanded. The founding Defenders and the Surfer reluctantly reunited when Yandroth resurfaced to menace the world. Though the heroes defeated his plan, the techno-wizard used his pseudo-sorcery to levy a deathbed curse upon their heads, binding them to come together in times of crisis. 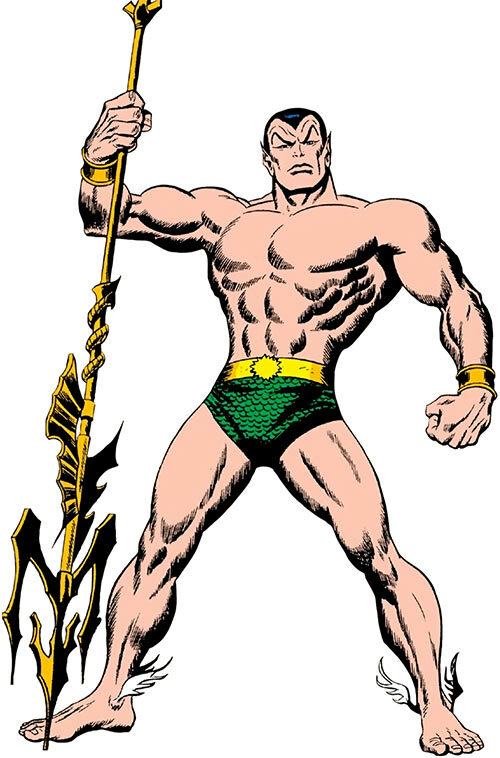 Namor is a tall Caucasian-skinned male. His Atlantean body is superhumanly dense. He has a handsome, angular face with upswept eyebrows and a rather pointed chin. He has Vulcan-like pointed ears and close-cropped black hair. His most common outfit is a simple pair of scaled green swim trunks with a gold belt, and a pair of metallic-gold bracers. 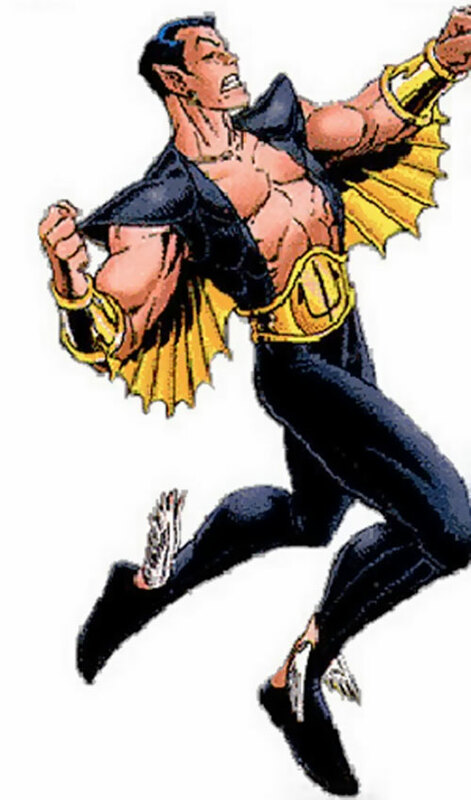 Namor has on a few occasions worn a different outfit, an open-chested, short-sleeved black body suit. His head and feet were still bare, and the suit had “glider panels” a la Black Bolt attached to Namor’s arms by black wrist bands. He usually carried a trident while in this uniform. Without question, Namor’s most prominent personality trait is his ego. This is true whether it manifests itself in his “vengeful monarch” or “noble champion” modes. Though capable of kindness and fairness, he’s usually impulsive and overconfident, with little regard for the consequences of his actions. He has no particular love for the surface world, and takes personal offense at ecological crimes taking place in the water. In the DCU, Namor *isn’t* the scion of Atlantean Royalty, but the product of an impulsive fling between an adventurous Atlantean woman and a surface man. Raised in seclusion by his mother with a fascination for the surface world, he eschews Atlantis for the life of an adventurer among the world’s super-heroes, a sort of cheery, self-satisfied equivalent of Marvel’s Hercules. I can just picture him playing straight-man to Beetle and Booster’s jokes in the Giffen-era Justice League. There is another alternate history in the Creature From the Black Lagoon write-up involving Namor in a DC/Marvel combined campaign using Kansas Jim’s proposed Secret Age. This history is the same as his Marvel history, except that he came into conflict with a fully-Atlantean brother after returning to Atlantis post-WWII. 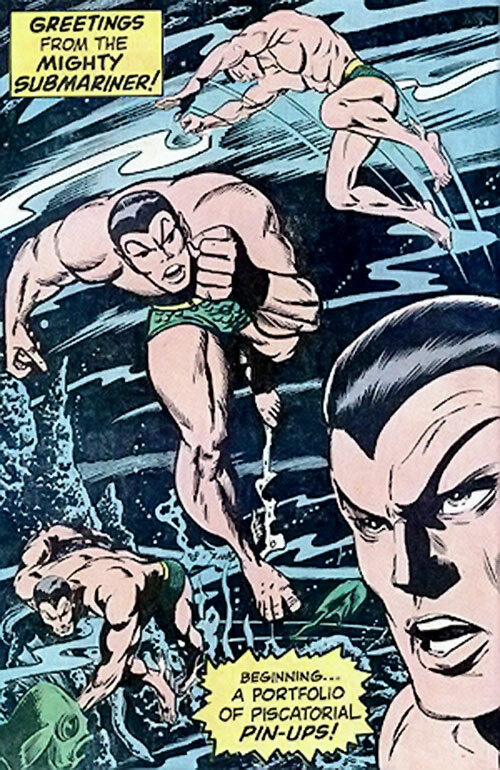 In the aftermath of their conflict (detailed in the CBL write-up), Namor left Atlantis and took up residence in the underwater caverns that came to be known in the modern age as the Aquacave. There, he added the tale of the strife between him and his brother to the Atlantis Chronicles. He returned to Atlantis when the earthquakes began and had the encounter with Paul Destine mentioned above. He has worked with Aquaman on occasion during the modern age, but for the most part, they seem to inadvertently alternate adventuring and residence in Atlantis. When one is in power there, the other is usually off adventuring, usually in self-imposed exile as a result of past events in Atlantis. Animal Mimicry only mimics the abilities of marine life and is Catastrophically Marginal. Flight is granted by tiny wings on his ankles. Flying indoor is not an issue, but his wings can be targeted and his Flight thus disabled. This requires a -2CS trick shot (0). Area Knowledge (Atlantic Ocean), Connoisseur, Languages (Atlantean, German), Leadership, Scholar (Business, sea creatures (including semi-mythical beings)), Slowed Aging, Misc: If Namor is immersed in water after his Gradual Loss Vulnerability has set, he automatically gains a Recovery check (this can only be done once per scene). Atlantis (High), Avengers (High), Defenders (High), Fantastic Four (High), Heroes For Hire (Low), Invaders (High), Namorita (High). MIA (Susan Storm Richards), Overconfident, Public Identity, Attack vulnerability (dehydration attacks, -2CS) – also see below for Namor and water. Trident [BODY 21, EV 04 (STR+1 w/STR)]. Magic Horn [BODY 04, Animal summoning: 10, Limitation: only on sea creatures, and Namor is most likely to use it to bring forth a single giant marine monster, R#2]. When he’s not immersed in water, Namor loses 3 APs in both STR and BODY, bringing him to STR 17 BODY 12. The longer he stays out of the water, the worse it gets. 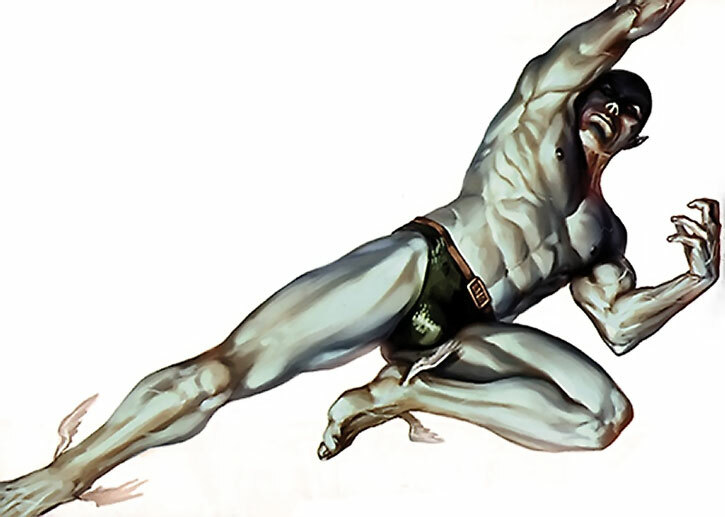 While out of water Namor suffers a Gradual Loss Vulnerability affecting his Physical Attributes and Powers; he loses 1 AP every two hours (12 APs) until his Powers are gone and his Physical Attributes have fallen to 07/10/08. 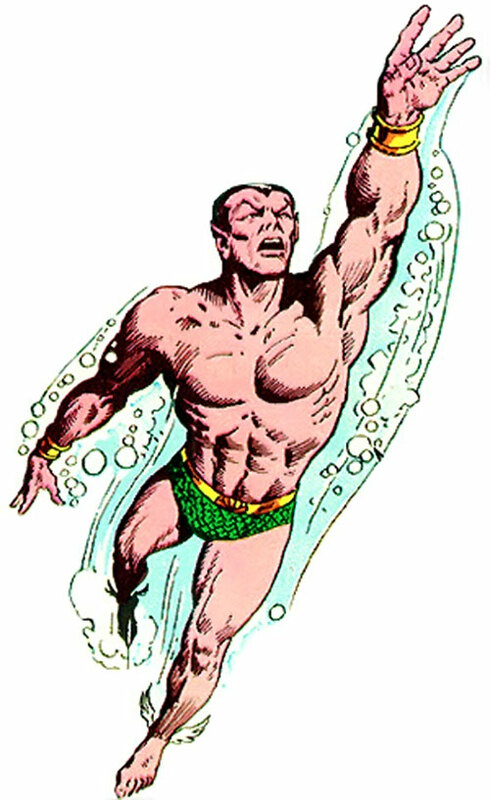 Namor’s Loss Vulnerability can be “reset” by being even momentarily immersed in water (having it poured over him, for example), although in most instances he’ll stay at the non-immersed power levels (i.e., STR 17 BODY 12). Namor is quite susceptible to attacks intended to speed dehydration. Not only does he has the straight Attack Vulnerability noted in his Drawbacks, but heat and flame attacks weaken Namor even more quickly. In addition to any damage inflicted, add the APs of the attack to the APs of time spent out of the water for Gradual Loss Vulnerability purposes. 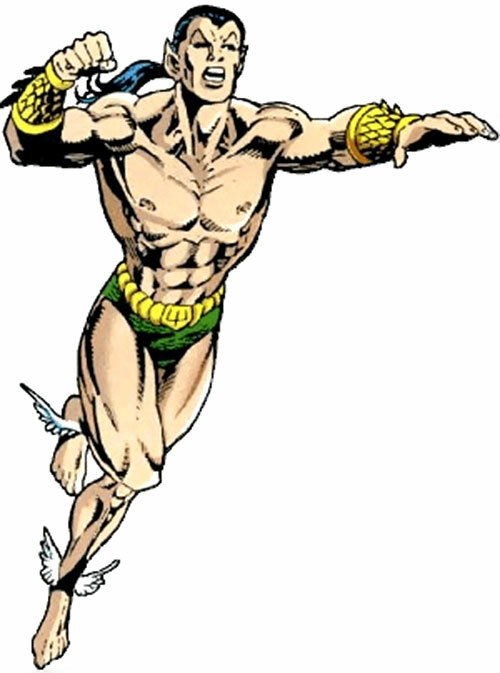 Namor, as an hybrid, as to spend about the same amount of time under sea and on dry land. If in a given week he does not spend at least two days in one of those environments, he gets a Minor Psychological Instability. If the quota is not met for two weeks, this becomes a Minor Rage and Serious Psychological Instability. If the quota is not met for a month or more, those becomes a Serious Rage and a Serious Psychological Instability. During those times that Namor is serving as Monarch of Atlantis he has the Authority Figure Drawback. When Namor first emerged and fought the Human Torch, he had the Mistrust Drawback. He bought it off during WWII, only to regain it when he began his war with the surface world anew during the 1960s. Namor does not currently suffer Mistrust. Namor has been Exiled from Atlantis Voluntarily and Involuntarily several times during his career. His involuntary exiles were usually due to political machinations, except for his absence after the amnesia inflicted by Paul Destine. 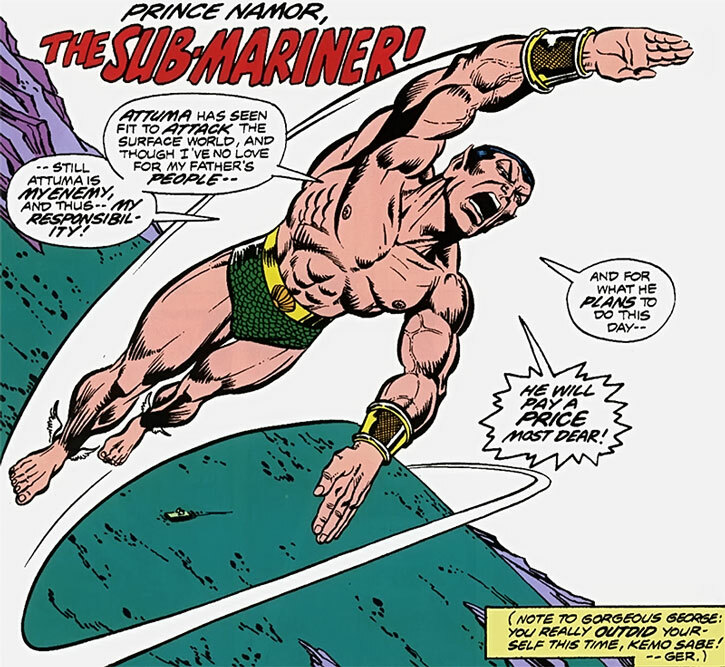 Namor also avoided Atlantis after various personal disasters, such as the death of Marrina. Namor was Married to an Atlantean woman named Dorma for several years, until she was killed by Llyra, a Lemurian empress. He also married Marrina of Alpha Flight, who was killed after her Plodex heritage caused her to mutate into a dangerous sea serpent. DEX 07 STR 16 BODY 14, with lack of immersion in water subtracting 3 APs from STR and 2 from BODY. The Loss Vulnerability becomes applied every hour rather than every two hours – possibly *much* less in the presence of heat and flame. Namor’s HPs were about 15 points lower back then – either that or he was operating in a more restrictive Genre. By Kevin J. Mulder, Sébastien Andrivet, Peter Piispanen. Source of Character: Marvel Universe comics. Helper(s): The entire list, background notes from the Official Handbook of the Marvel Universe, Roy Cowan.